Portland, Oregon-based Down to Earth Designs, Inc., which does business as gDiapers, has settled Federal Trade Commission charges that it made deceptive claims about its products’ biodegradability, compostability, and other environmentally friendly attributes. The proposed settlement order bars gDiapers from making claims alleged in the complaint, unless they are true and not misleading, are adequately substantiated, and meet specific requirements in the FTC’s recently revised Green Guides. gDiapers markets and sells the gDiapers diaper system, which includes a reusable outer shell (gPants) and disposable pad inner liners (gRefills), as well as baby wipes (gWipes). According to the FTC’s complaint, the company advertised both gRefills and gWipes as biodegradable and compostable. The company also claimed that gDiapers diapers were plastic-free, and that disposing of gRefills by flushing them down the toilet was environmentally beneficial. The FTC’s complaint alleges that the company made false or misleading representations in marketing gRefills and gWipes as biodegradable. These representations include claims that: the products are “100% biodegradable” and “certified” biodegradable; gRefills and gWipes will biodegrade when tossed in the trash; gRefills will biodegrade when flushed; and gRefills offer an environmental benefit because they can be flushed. In fact, the complaint alleges, gRefills and gWipes are not biodegradable because they do no completely break down and decompose into elements found in nature within one year after customary disposal, which is in the trash. Product website claimed biodegradability and compostability of diaper liners. Next, the complaint alleges that gDiapers misled consumers when advertising gRefills and gWipes as compostable at home. According to the complaint, the company failed to adequately disclose that consumers cannot safely home compost gRefills and gWipes soiled with solid human waste – a material limitation. Where gDiapers did disclose that limitation, in many cases the disclosure was not clear and conspicuous. 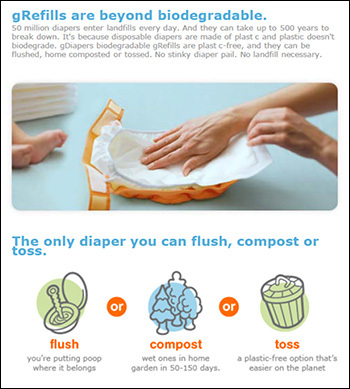 For example, gDiapers made an unqualified home compostable claim on its website’s homepage, only to reveal the limitation on other site pages. Additionally, the complaint alleges that gDiapers lacked substantiation for its claim that gWipes are home compostable. Finally, the company advertised gDiapers as plastic free, positioning the product as one that would help consumers “end plastic diaper use.” These claims, the complaint alleges, were deceptive, because the gPants component of the gDiapers system contains plastic. The proposed order prohibits gDiapers from making biodegradable and compostable claims, unless the claims are true, not misleading, substantiated by competent and reliable scientific evidence, and meet specific requirements outlined in the FTC’s revised Green Guides. 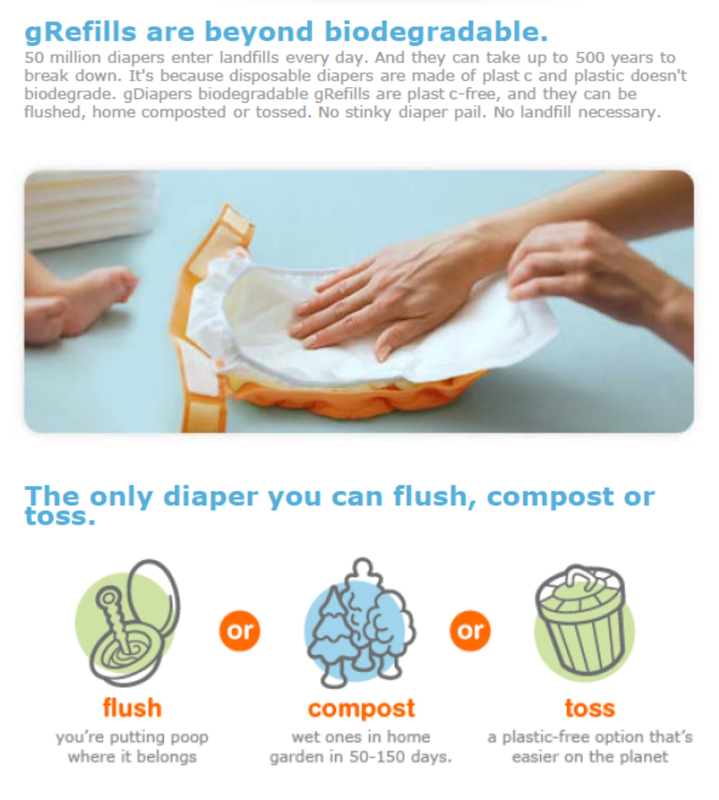 Additionally, any claims that a disposable diaper or wipe is compostable must clearly and prominently disclose that the product cannot be composted if soiled with solid human waste. The proposed order also prohibits “free of” certain materials claims, such as plastic, unless the claim is true, not misleading, and substantiated by competent and reliable scientific evidence. It also prohibits specific environmental benefit claims unless the representations are true, not misleading, and sufficiently substantiated. General environmental benefit representations are prohibited unless gDiapers discloses the specific environmental benefit, and each reasonable interpretation of the represented benefit is true and substantiated. The proposed order also prohibits gDiapers from making misrepresentations about certifications, including independent third-party certifier evaluations. For a complete description of the terms of the proposed order, see the analysis to aid public comment for this matter. Information about shopping green for consumers can be found on the FTC’s website. More information about environmental marketing can be found in the agency’s Green Guides for businesses. The Commission vote to accept the consent agreement packages containing the proposed consent order for public comment was 4-0. The FTC will publish a description of the consent agreement package in the Federal Register shortly. The agreement will be subject to public comment for 30 days, beginning today and continuing through February 18, 2014, after which the Commission will decide whether to make the proposed consent order final. Interested parties can submit comments electronically or in paper form by following the instructions in the “Invitation To Comment” part of the “Supplementary Information” section. Comments in paper form should be mailed or delivered to: Federal Trade Commission, Office of the Secretary, Room H-113, 600 Pennsylvania Avenue, N.W., Washington, DC 20580. The FTC is requesting that any comment filed in paper form near the end of the public comment period be sent by courier or overnight service, if possible, because U.S. postal mail in the Washington area and at the Commission is subject to delay due to heightened security precautions.